Goigs are a characteristic form of popular religious song on the island of Sardinia. 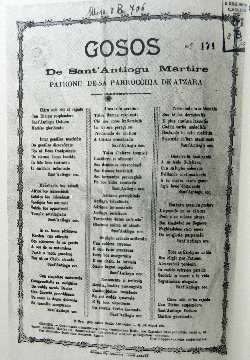 The songs are part of the musical heritage of Sardinia as a result of the island having been part of the Aragonese-Catalan state known as the Crown of Aragon that colonized Sardinia in the 1300s and 1400s. *1 The word goigs ("joys") is Catalan*2 and though that word may be still be used in Sardinia, the songs may also be called gosos (image, below, left) or gozos, or goccius, depending on location. In the form that has come down to us, goigs are songs that praise Christ, the Virgin and the saints, while at the same time invoking a series of favors to protect persons, livestock and the harvest. The songs are usually sung collectively on the occasion of pilgrimages, processions, novenas, and festivals in honor of the local patron saint. The songs were passed down orally and have existed in handwritten and then printed form since the 1400s. Thus, in the period after the passing of the Crown of Aragon, when the Catalan language was threatened by the dominance of Castilian Spanish, the goigs were, for much of the population in Catalonia, the only chance to read Catalan, even if some of the examples that have been preserved are written in Castilian or in a hybrid language. in 1899 in Girona in Catalonia. The most characteristic Catalan printed format is laid out with the title at the top, then a woodcut of the divinity being invoked below that (the version on the right is a slight variation) followed by two or three columns of text and, finally, the responsory and oration in Latin, all enclosed in a frame. That format for the Catalonian version seems to have been formalized by the mid-1600s. The Sardinian goigs are similar in format, printed on single-page leaflets or "flyers" with the text in columns, all within a border/frame, but they rarely have woodcut illustrations and the borders are usually simple. They are much less ornate than Catalan examples. *3 On the island, the songs have also been written in various versions of Sardinian since the 1700s. 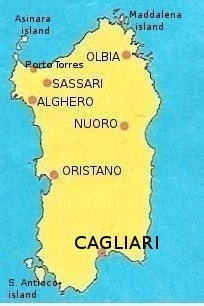 SW of Nuoro in central Sardinia. Although the Catalan and Sardinian goigs are, by definition, religious songs, they have a secular origin. In terms of meter and the form of verses and refrains, they derive from the olden dansa and balada of the troubadours of the Provence, where songs were sung in praise of knights and ladies. Those forms were differentiated by how parts of the text repeated—small differences, perhaps, but ones that found their way into the later religious texts. 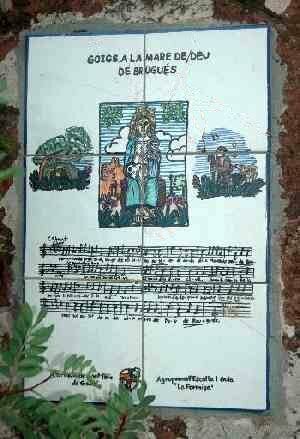 James II of Mallorca seems to have been the composer of the first religious goig (Mayre de Déu e fylha) in 1305. 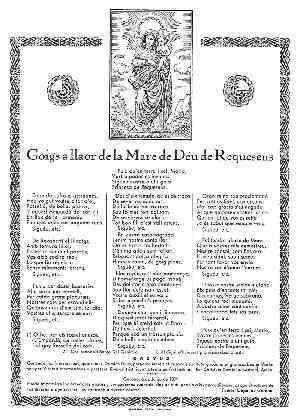 Form and meter became standardized in the 1400s and 1500s, and the singing of these songs was widespread by the end of the 1600s both in Catalonia and on Sardinia. Most of the texts are anonymous, although there are some examples of texts by known poets. The format of the printed goigs did not generally allow for musical notation, so the melodies were handed down orally, with some melodies doing service for dozens of texts. It is difficult to judge whether the music was composed formally, perhaps by a known musician, or perhaps simply hummed into existence by a farmer with a good ear. Although musical notation is generally not printed on the standard goigs pages, there do exist artistic renditions of goigs leaflets that display the music as well as text. One of these, for example, is a ceramic tile display of the Goigs a la Mare de Déu de Bruguers in the town of Gavà near Barcelona (photo, right). The 1800s saw the birth of "goigistic" associations and collecting in both Catalonia and on Sardinia, but there is apparently still no systematic catalog of them all. There may be as many as 30,000. There are prominent collections of goigs in a number of libraries in Catalonia, principally the Library of Catalonia, the Public Episcopal Library of Barcelona, the Library of Montserrat (near Barcelona) and the Historical Archives of the City of Barcelona. Sardinian libraries and associations have examples, as well. As a final note, we emphasize that not only are the religious goigs still sung, but have also re-embraced their secular origins; there are now humorous and satiric texts, and political and social ones, sung in the same specialized metric forms and to the same melodies that have praised the saints though the centuries. BOVER I FONT, August. 1984. "The Sardinian Goigs" in I Catalani in Sardegna [The Catalans in Sardinia], eds. Carbonell, Jordi and Francesco Manconi, pub. by the Consiglio regionale della Sardegna and the Generalitat de Catalunya. CIPRIANI, Roberto. "Diffused Religion and Prayer" in Religions 2011, 2, 198-215, ISSN 2077-1444 www.mdpi.com/journal/religions. -ALFORD, Violet. "Valencian Cross-Roads" in The Musical Quarterly, Vol. 23, No. 3 (Jul., 1937), pp. 367-387. Vol. 26, No. 4 (Oct., 1940), pp. 494-528. Pub: Oxford University Press. -ATZORI, M. "Rapporto tra canzoni religiosi catalane e canti religiosi sardiI i goigs e i gosos" (Relation between Catalan Religious Songs and Sardinian Religious Chants: Goigs and Gosos) in Studi Sardi, XXIV, pp. 575-591. Pub: Univ. of Cagliari. -STEVENS-ARROYO, Anthony M. "The Evolution of Marian Devotionalism within Christianity and the Ibero-Mediterranean Polity" in Journal for the Scientific Study of Religion, Vol. 37, No. 1 (Mar., 1998), pp. 50-73. Pub: Wiley-Blackwell.